Brought myself up with the latest discoveries on human origins last night with BBC doco The Lost Tribes of Humanity. It told me that everything I had been taught about Neanderthals at school was wrong, and enlightened me on how to pronounce this other type of human I’ve come across in my reading from time to time, the Denosivans, introduced me to the term “hominin”, and backed my wife’s suspicion that I probably do carry around Neanderthal DNA in my genome. They were not wiped out by the arrival of Homo Sapiens. The two types of human lived side by side for thousands of years, probably learning from one another. The above fact indicates that modern humans interbred with Neanderthals very early in their trek out of Africa — probably when they first met Neanderthals in what today is the Middle East. This scenario would explain why modern humans across the globe contain Neanderthal DNA — with the exception of most Africans. Races native to Australia and Papua New Guinea contain up to 5% of the Denisovan genome. Denisovan DNA is also found among the peoples of India, Himalayas and China. 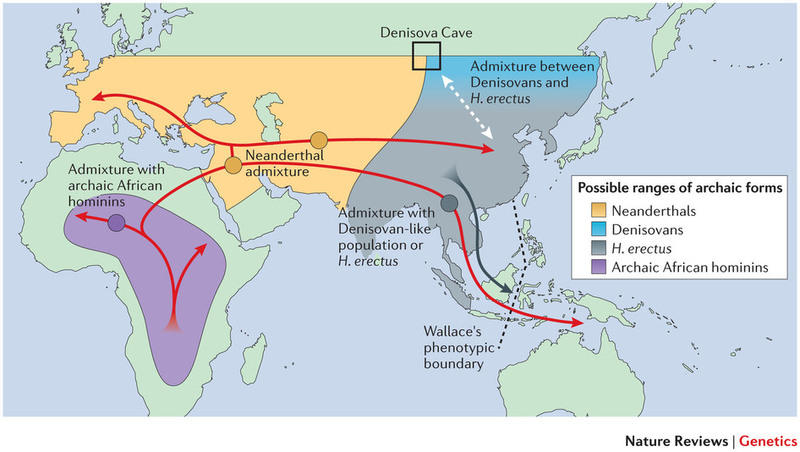 Up to 60 to 80% of Denisovan genome may be spread around in modern humans. I was following the controversy surrounding these bones when they were first discovered in Indonesia and for a time was unsure if we would find we had a new type of human species or modern human inflicted with something like dwarfism. But the jury has apparently long been in by now and they definitely have been classified as a distinct variety of human. Interestingly their small size was not the effect of being cut off on the island (animals so cut off tend to become smaller, presumably because less resources are therefore required to survive) but they were found to be small before their settlements were cut off by rising seas. Though they have left remains indicating their human-ness their brains were the size of chimp brains. Sounds bad for a human, perhaps, but then as someone else pointed out recently on another program, we now know from our technological advances that it is not the size of a computer that matters so much as how it is organized. Even “bird-brains” can be very intelligent. This group was new to me. We know of their past existence in Central Africa entirely from DNA samples among people of African descent — beginning in a laboratory in San Francisco of all places. They split off from the earliest human line then connected again some millennia later with the line leading to us. So we don’t even need to dig up fossils to learn of the existence of other species or tribes of humans. Interbreeding can have been through a range of activities, including adopting orphaned babies and raiding for mates. My science fiction fantasy: Will we one day be able to piece together all the different bits of remaining DNA from Neanderthals and Denisovans and Archaic Africans and somehow put them together again the way Humpty was sort of reassembled — not literally in laboratories, god forbid, but on paper/digital files — and get some idea what those other branches of hominin were like compared with our pre-mongrel ancestors? Posted on 2017-03-06 06:31:49 GMT+0000 by Neil Godfrey. This entry was posted in Evolution, Science and tagged Evolution. Bookmark the permalink. I have a feeling (and I think the recent sapiesn-neandertal-denisovan evidence backs me up) that there was much more interbreeding between ancient human types than is yet acknowledged. As a human male I am aware that we will mate with pretty much anything that doesn’t out run us. Yes, you have to keep a close eye on your ancestors. Otherwise they will get up to all sorts of improper behaviour. Thanks. Will have a listen. So Neanderthals are superior to Africans (no tooth decay bacteria) but we’re supposed to believe racism is bad. Seems to me Neanderthals were more evolved and we’d have been better off if our ancestors had been a bit more racist and not interbred with those Africans who gave us teeth decay. I presume (hope) you are being facetious. Neil, I’d love to see your Neanderthals/Denisovans/Archaic African sci-fi scenario come to life, too!